I have two degrees in astrophysics - a Bachelor's degree from the University of Birmingham, and a Master's degree from the University of London. For my MSc research I studied the Big Bang, trying to understand what the universe was like when it was less than one second old. I made this web page because I wanted to see for myself what the universe looked like, and I thought maybe some other people out there might also be interested. And thanks to Paulo Baartz who offered to translate this web page into Portuguese; Norbert Rumiano who offered to translate this web page into French - his astronomy website is worth a look too; Ramiro Clavijo who offered to translate this web page into Spanish; Michael Grochowiec who offered to translate this web page into Polish; Joan Giron�s who who offered to translate this web page into Catalan; and Murat Tun�ay and Tahir Şişman who offered to translate this web page into Turkish. (German and Dutch versions may possibly appear soon also). Thirty thousand years ago, a massive star in the Perseus Arm of our galaxy exploded. For a few weeks the explosion would have shone with the light of a billion suns. Our ancestors would have seen this supernova explosion as a bright point of light that would have been visible in daylight. This picture shows what is left of this star today. 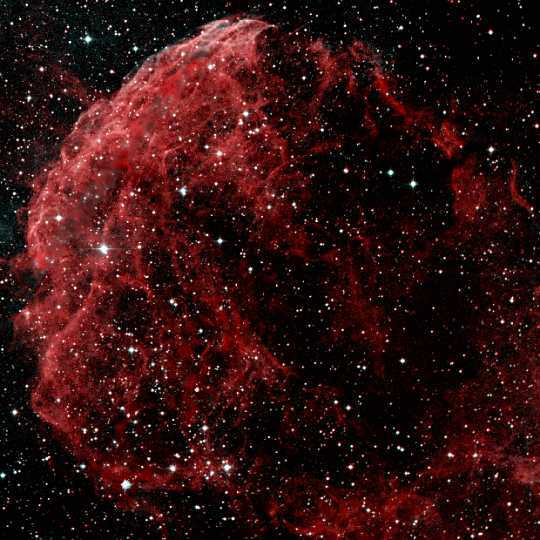 The remains of the star are now an expanding bubble of debris sixty light years in diameter. Eventually much of this material may end up in new stars and planets.